Frustrated by the lack of progress on Alzheimer’s, In 2010, two passionate social entrepreneurs, George and Trish Vradenburg, together with co-founders Meryl Comer and John Dwyer, created UsAgainstAlzheimer’s. Combining the force of possibility and the power of optimism, their approach has been to disrupt the status quo, identify the barriers to success, and fight for a cure. To ensure that the power of Trish’s optimism and commitment to stopping Alzheimer’s continues to be felt in this fight, we have launched the Be Trish campaign. 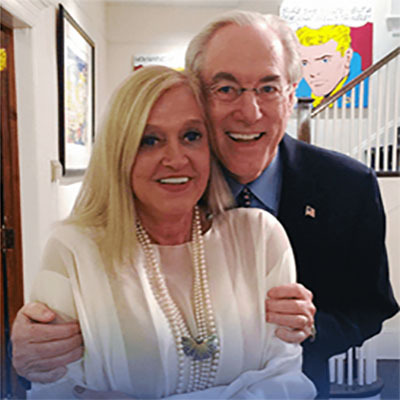 When he spoke at her memorial service, Trish’s brother Michael called on those gathered to “Be Trish” by adopting her commitment to this fight. If we can all “Be Trish” in some small way, the force of our unity of purpose can defeat this cruel and massively destructive disease. Trish was dedicated and persistent in working for research dollars...Trish didn’t take ‘no’ for an answer and she never relented in her fight for a cure. Trish’s journey was one that has made a tremendous difference in the lives of people. Not only for her vision, but for how she approached the work with such love, respect, kindness, beauty, sparkle, you name it. That was Trish. Trish’s passion and knowledge helped to drastically increase our investments in Alzheimer’s disease research, and to improve care and support for patients and their families. As highly accomplished professionals, it would have been easy and fair for George and Trish to rest on their laurels and enjoy a leisurely retirement. But instead, they have invested their time, energy and resources to building the global movement that is UsAgainstAlzheimer’s. Their passion is born out of their own suffering in caring for Trish’s mother, Bea Lerner, who was struck down by Alzheimer’s. We have a national Alzheimer’s plan being implemented by the White House. There would not have been a national goal of 2025 if it weren’t for George and Trish. We have greater resources devoted to preventing and treating the disease and an unwavering advocate in the African American Network Against Alzheimer’s.